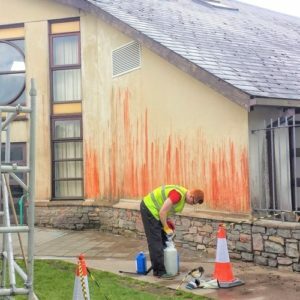 The school building had suffered over 15 years of red and black algae growth which caused severe staining. 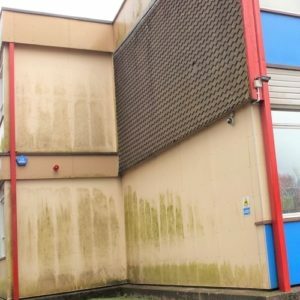 This coupled with moss and lichen build up gave the appearance of a neglected school, thus affecting the school intake as well as morale. The Head Teacher requested help to find an algae removal solution to enhance the visual impact of the school. 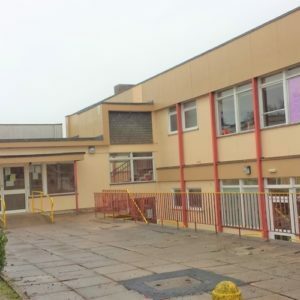 The local authority called APT-ICC Ltd to seek professional advice after several companies had quoted for cleaning and repainting the K Render Surface. Two commercial cleaning companies failed to respond after seeing the algae problem. The school was built over three levels with very limited access. The school needed to remain open whilst the cleaning took place, meaning that young children, teachers and parents needed to be considered. 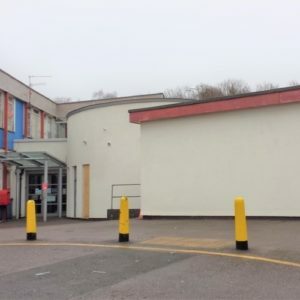 APT-ICC Ltd carried out a full survey of the property, over 3000 square meters of k render surface coating over three levels, some with limited access. We then carried out a test sample for approval by the client. We advised the client on the type of cleaning and method necessary, along with the ongoing future maintenance programme to keep the building and surrounding areas pristine. Once the approval was received, we engineered and organised the cleaning program, along with the health and safety risk assessment. We hired the specialised lift access and materials including the APT K Render Algae Removal Cleaner, used to kill algae, remove moss and other surface stains. 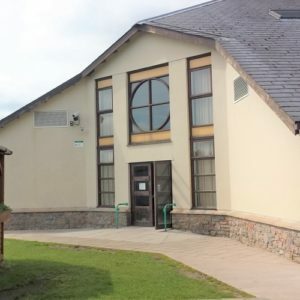 The K Render cleaning and treatment works were carried out over a 10-day period, working late evenings and weekends in order to minimise the disruption to the school programme. The K Render Cleaning results speak for themselves. Both staff and parents were amazed and delighted with the outcome, commenting “that the school is as good as new”. The K Render did not need to be painted as was first proposed by other companies thus saving tens of thousands of pounds. APT scheduled the above factors into the works plan, we managed it vigorously making the necessary allowances. It was completed on time with excellent results.